Coal has been around a long, long time, no doubt. But the investing landscape has changed drastically over the past 10 years. Rising economies in Asia and Latin America have emerged hungry for power and heavily reliant on coal. And despite a greater reliance on other forms of energy, many advanced economies still count on coal for energy. Still, health risks, government regulations, climate change, and new alternative power sources threaten the fuel's primacy. Some analysts say coal is dead in the water. Others say it's oversold and due for a comeback. We're going to break down all the investing angles and tell you. Coal's greatest attribute is its low cost. That means the total cost — per-megawatthour (MWh) — of building and operating a power plant over the course of its lifetime. By this measure, it costs about $60 per MWh to produce energy from coal. That compares to $115 per MWh for solar, $72 for hydro, $71 for nuclear, and $64 for wind. Coal is cheap, plain and simple. 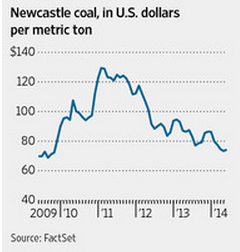 Earlier this year, coal prices fell to their lowest level since September 2009. The reason is not a lack of demand, but rather oversupply. That dynamic will eventually shift, as miners scale back production. But for now, there's just too much coal on the market for prices to rise. As a result, most analysts believe the fuel will continue to hover at its current level, rising only modestly in 2015. That's bad news for coal miners and investors, but good news for buyers. On the flip side, though, the fact that it's so cheap is the only thing keeping energy companies from switching to other fuel sources. The bottom line: Coal will continue to be one of the cheapest fuels on the market for years to come. And that will make it difficult to replace. Clearly, its cost gives coal a substantial edge over its competitors. The problem is, it's dirty. Coal emits anywhere from 205 to 230 pounds of CO2 per million Btu of energy, compared to 157 for gasoline, and 117 for natural gas. 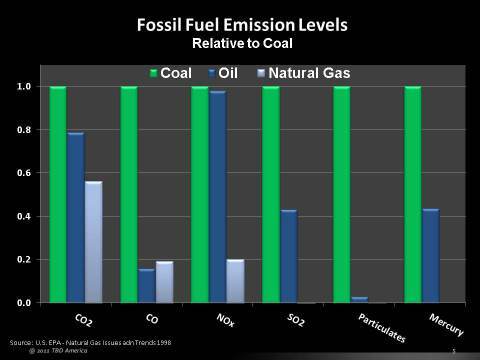 Just look at this graph that shows how much carbon dioxide (CO2), NOx, sulfur dioxide (SO2), and mercury coal emits compared to other fossil fuel sources. Make no mistake, coal is the dirtiest fuel out there. In fact, existing coal plants — most of which are more than 40 years old — are collectively the single largest source of U.S. carbon pollution, accounting for 38% of all CO2 emissions. It's even worse in emerging markets. Coal pollution in China has become a national, and international, epidemic. China already uses more coal than the United States, Europe, and Japan combined. And every week, another coal-fired power plant opens somewhere in China. As a result, the country and its neighbors are being blanketed by thick clouds of soot. And the air is rife with carbon and sulfur dioxide. The sulfur dioxide has made China's acid rain problem the worst in the world. And along with the CO2, it's contributed to a huge spike in lung cancer and other respiratory diseases. In 2011 alone, more than 260,000 deaths were attributed to China's coal pollution. And that says nothing of the emissions' contribution to climate change, which is significant. The bottom line: The health hazards and environmental effects of coal pollution are a major threat to the fuel's sustainability over the long term. In spite of the pollution it creates, coal is still a fixture in developed countries. And its prevalence and low cost make it the go-to option for rapidly industrializing emerging markets, as well. Coal provided 39% of U.S. energy in 2013, a higher portion than any other fuel. In China, it's double that at 80%. It's 44% in India and 39% in the United Kingdom. No doubt, coal has a long history in the United States and Great Britain. The infrastructure — power plants and delivery system — is already in place (though it may be aging). The corporate interests are firmly entrenched with a powerful political presence. And, again, it's abundant and cheap. U.S. coal production peaked in 2008, but it's still at historically high levels. It's second only to China in that regard. Indeed, the world's two biggest coal producers also happen to be the world's two biggest energy consumers. As long as that's the case, coal is going to have a role in energy production. That's particularly true in the short-term, because other fuel sources face their own unique challenges. Nuclear energy, for example, is thought by many to be too risky — especially in the wake of Japan's Fukushima disaster. And alternative energies, like wind and solar, are still too expensive/inefficient. Its competitors will have to work hard to marginalize coal, which won't go quietly. As we talked about earlier, coal's carbon output is a serious liability. Higher regulatory costs and increased competition from cleaner fuel sources are chipping away at coal's dominant market share. Indeed, coal may still account for 39% of U.S. energy, but that's down from 42% in 2011 and 57% in 1985. Again, one reason for that is regulation, which has gotten a lot tougher over the past decade. Most recently, the Environmental Protection Agency proposed cutting energy emissions from existing coal plants by about 30% over the next 15 years. And that's just the latest offense in a regulatory onslaught of red tape. It's not just the United States, either. China is ramping up regulations, too, fully understanding that its pollution problem has become both deadly and embarrassing. It's been reported that the government will ban the use of coal in Beijing and other urban areas by 2020. And a national cap on coal use could come as soon as 2016. Another problem is that cleaner alternatives are getting cheaper. The principal threat here is natural gas. You see, natural gas has always been cleaner than coal, but only recently did it become inexpensive. A few years ago, the advent of fracking and horizontal drilling sent natural gas companies into a production frenzy. The result was a glut of natural gas that drove prices to record lows. Natural gas prices have bounced back a little bit over the past year or so. But that really doesn't matter, because when you take into account the savings you get from avoiding the emissions and regulatory costs of coal, natural gas is much cheaper. So while coal's share of the U.S. energy market is receding, the role of natural gas is expanding. Gas now accounts for 27% of U.S. energy production and it's on track to pull even with coal by 2017. Interestingly, China's natural gas reserves are even bigger than those of the United States. But its consistency isn't the same and the country isn't as amenable to fracking. China also lacks the technology and expertise of Western firms. But that's a gap it has been working to close. Even without natural gas, China is employing a multi-faceted energy approach, expanding its capacity in solar, hydro, and nuclear power. Decades from now, these technologies will marginalize coal in China as well as the United States. 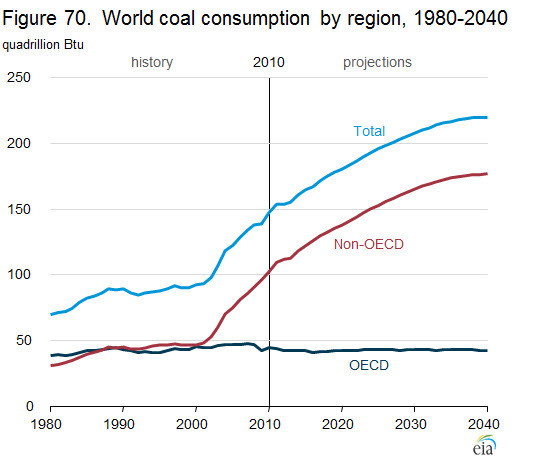 It's difficult to say where coal will go from here. Its demise could be either prolonged or hastened by government policy — both in the United States and abroad. In the short term, most analysts agree coal has been oversold. And given that it will take decades more for its main users to switch to other energy sources, its price could certainly rebound. That rebound will likely come as producers (which have been wrecked by the price decline) cut back and reign in supply. But ultimately, coal's days as the dominant energy source are numbered. It will be replaced initially by natural gas, and then a blend of renewable energy sources.